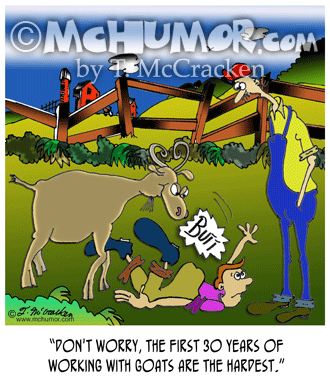 Goat Cartoon 9072: As a new hand is butted by a goat an old hand says "Don't worry, the first 30 years of working with goats are the hardest." 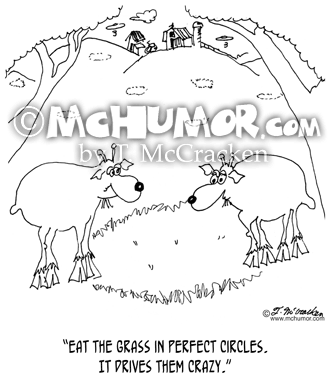 Goat Cartoon 6944: A goat says to another, "Eat the grass in perfect circles. It drives them crazy." 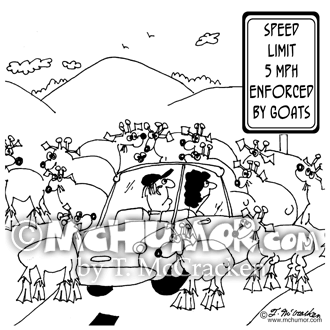 Goat Cartoon 7248: A road sign: "Speed Limit 5 MPH. 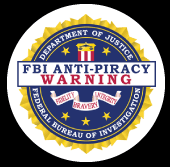 Enforced by Goats." Cars are stopped as goats cross a road. 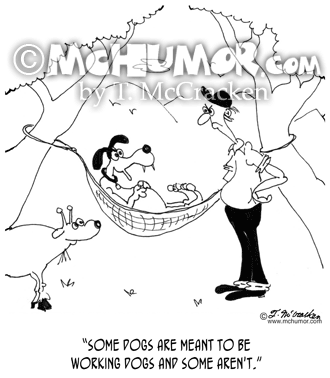 Dog Cartoon 7046: A dog swinging in a hammock on a ranch says to an angry foreman, "Some dogs are meant to be working dogs and some aren't." 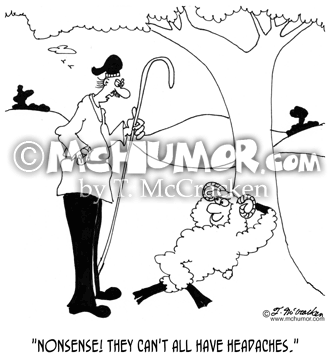 Goat Cartoon 5574: An indignant farmer saying to a ram reading under a tree, "Nonsense! 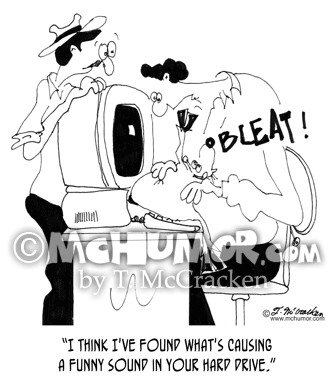 They can't All have headaches." 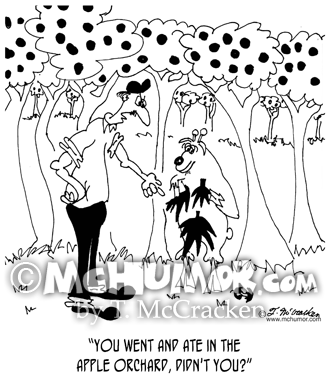 Goat Cartoon 9119: A ranch hand looking at a goat in a fig leaf saying, "You went and ate in the apple orchard, didn't you?" 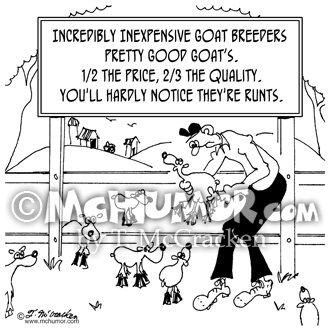 Goat Cartoon 7223: Incredibly Inexpensive Goat Breeders advertises, "Pretty Good Goat’s. Half the price, 2/3 the quality. 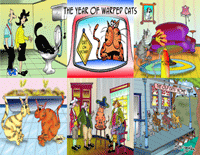 You'll hardly notice they're runts." 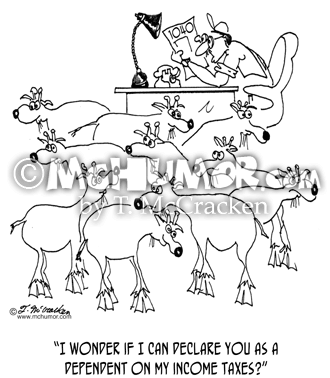 Goat Cartoon 6945: A goat herder looks at his goats and says, "I wonder if I can declare you as dependents on my income taxes?" 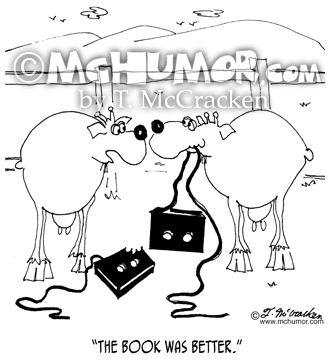 Goat Cartoon 7023: A repair person pulling a goat from a hard drive says, "I think I've found what's causing a funny sound in your hard drive."